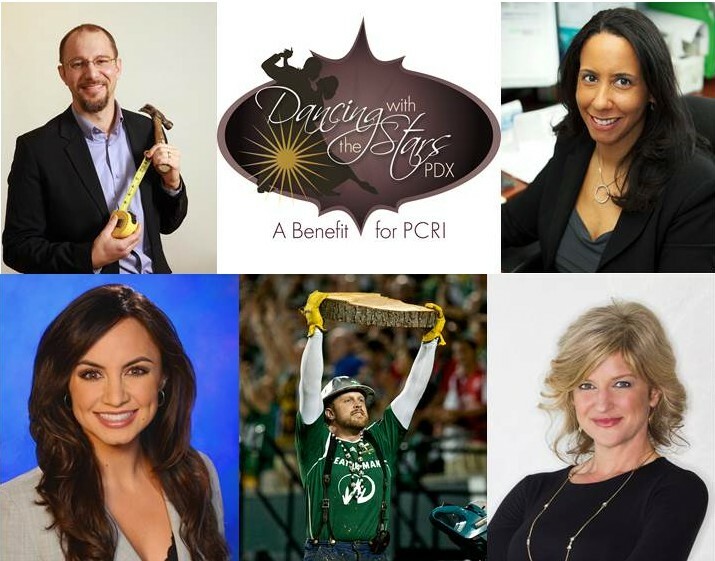 PCRI’s 2013 Dancing with the Stars Gala featured five prominent Portland community members (clockwise from top right): Simone Brooks, Jill Nelson, “Timber” Joey Webber, Katherine Cook, and Adam Zimmerman, each trained by and dancing with professionals from Fred Astaire Dance Studio. Read more about the 2013 gala here, including a featured dance by Portland Mayor Charlie Hales and First Lady Nancy Hales. Simone Brooks, President of S. Brooks & Associates, Inc., better known as Brooks Staffing, is committed to providing employment solutions for employers and applicants that enhance and diversify the workforce, and provide jobs for the community. Simone served as a Resident Board Member for Portland Community Reinvestment Initiatives (PCRI) before transitioning into the role of community Board Member. Simone served from 1999 to 2007. She knows from direct experience how vital access to affordable housing is to accessing economic security and eventual prosperity. Simone is the mother of two wonderful children Kaeshon and Sadella Adams. While Simone loves to watch ballroom dancing, dancing in the 2013 gala was her first experience under show lights. Katherine Cook is a reporter for KGW NewsChannel 8 and has been with the station since the summer of 2007. Her news writing has earned several first place awards from the Oregon Associated Press and the Oregon Association of Broadcasters. She was also nominated for a Northwest Regional Emmy for Sports Reporting in 2011 and is a member of the National Association of Hispanic Journalists. A native Oregonian, Katherine is passionate about her community and telling the stories of those who live in it. She is thrilled to take part in the Dancing with the Stars gala knowing that her part will help make a difference in the lives of many deserving families. Katherine grew up in Portland and attended Reynolds High School. She earned degrees from Mt. Hood Community College and Western Oregon University, where she ran track for the Wolves. In her spare time, Katherine enjoys running, hiking, painting, playing the violin and is an avid sports fan. While the gala was her first venture into ballroom dancing, Katherine is no stranger to a dance floor. She started taking ballet lessons at age four and continued on-and-off through college. As Founder & CEO of the nation’s #1 best small company to work for according to Fortune Magazine, Jill Nelson has led Ruby Receptionists to ten straight years of double-digit growth and created more than 100 jobs in the Portland community since launching Ruby in 2003. The highly acclaimed virtual receptionist company serves over 2,100 businesses across the U.S. and recently won the prestigious Lighthouse Award for ranking on the Portland Business Journal’s Fastest Growing Companies list for five consecutive years. When Jill is not at the office, she’s helping other business owners through Entrepreneurs’ Organization; she has held multiple board positions and mentored many small business owners through the EO Accelerator program. In addition to her passion for business, Jill keeps busy staying fit through dancing, weight-training, and running, and in the fall, you’ll catch her at every Oregon Ducks football game, cheering on her alma mater. In 2010, the Portland Business Journal honored Jill with an Orchid Award for her service as a female business leader who is deeply involved in the community. She is delighted to have the opportunity to help others in need through the PCRI Gala. You’ve seen Timber Joey sawing a log at Portland Timbers soccer matches, but guests at the 2013 gala had a rare chance to see him cut a rug at the Dancing with the Stars Portland gala! While Joey, a Philomath, Oregon, native didn’t have his trademark chainsaw in tow at the gala, he’s no stranger to competition, participating in state forestry and timber competitions. He ranked in several events including pole climbing, jack double bucking, fire hose relays, axe throwing, log rolling and hot saw operation. He was also a competitive rugby player and bare-back bronco rider prior to representing the Timbers, which he’s done since 2008. PCRI is a big fan of the Timbers, even before their Major League Soccer debut in 2011. We’ve cheered on the team as part of group benefit nights, and are proud recipients of funding from the Portland Timbers Community Fund. Adam Zimmerman was named by Portland Business Journal as one of the city’s movers and shakers in the Business Journal’s “40 Under 40” honors for 2013. He earned that honor while serving as Executive Vice President at Craft3. Craft3 is a bit unusual, they are a non-profit company that makes investments in economic, environmental and family resilience in Pacific Northwest communities. Craft3 makes loans to companies, non-profits and even individuals that are making the northwest a more resilient and sustainable region. For his part, Adam manages marketing and consumer lending at Craft3. Mr. Zimmerman is originally from Milton-Freewater, but has spent time living all over Oregon, including stints in Eugene, Coos Bay and Myrtle Point. His various service engagements have ranged from the Coos County Fair Board to an appointment by Governor Kitzhaber to the Oregon Growth Board. Oh, and for the record, he’s a Duck. Talking about favorite ways to pass time outside the office, Mr. Zimmerman describes the fun he has in a music class he attends with his kids. “It’s about dropping your inhibitions, singing, dancing, and being silly.” He brought this same enthusiasm to the gala, though with a bit less singing and a bit more dancing.